From budgies and cockatiels to chipmunks and chinchillas, our interest in exotic pets has rocketed in recent years. With the house rabbit being the UK's third most commonly kept pet after the cat and dog, and sales in small mammals, reptiles and birds continuing to grow, exotic pets have now become a specialist area of veterinary practice in their own right. 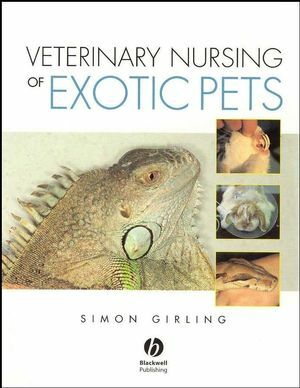 Veterinary Nursing of Exotic Pets is the first book to address the need for a definitive reference book devoted entirely to the principles and applications of nursing exotic species. Developed from a City and Guild's course, it not only covers husbandry, nutrition and handling, but also explores anatomy and chemical restraint, and provides an overview of diseases and treatments. Simon Girling has run a first opinion and referral service for exotic animals at the Braid Veterinary Hospital in Edinburgh since 1995. He is currently a Council member and Treasurer for the British Veterinary Zoological Society, an advisor to the Royal Zoological Society of Scotland’s Edinburgh Zoo and Highland Wildlife Park, and a Trustee and Treasurer for the Zebra Foundation, a charitable trust funding veterinary education in zoological medicine. Simon has authored and co-authored several texts on veterinary medicine for exotic species. 1 Basic avian anatomy and physiology. 2 Avian housing and husbandry. 3 Avian handling and chemical restraint. 6 An overview of avian therapeutics. 7 Basic reptile and amphibian anatomy and physiology. 8 Reptile and amphibian housing, husbandry and rearing. 9 Reptile and amphibian handling and chemical restraint. 10 Reptile and amphibian nutrition. 11 Common reptile and amphibian diseases. 12 An overview of reptile and amphibian therapeutics. 13 Basic small mammal anatomy and physiology. 14 Small mammal housing, husbandry and rearing. 15 Small mammal handling and chemical restraint. 17 Common diseases of small mammals. 18 An overview of small mammal therapeutics. Appendix 1 Legislation affecting exotic pet species in the UK.